Yes, I think I have gone Bananas. In more ways than one. LOL That happens sometimes when you have kids. Well seriously. I love this banana kid image it is just too much fun! I just had to put him on a banana card too. See I told you I have gone bananas! You just have to have humor to get through life without losing your mind. You know what I mean? When you need a little humor go over to Hambo Stamps and pick up one of their lovely images. You can add a little humor into someone's day. Nothing is better than a little laugh now and then. I love it! That is so cute & love the idea of the banana shaped card. What a great idea! 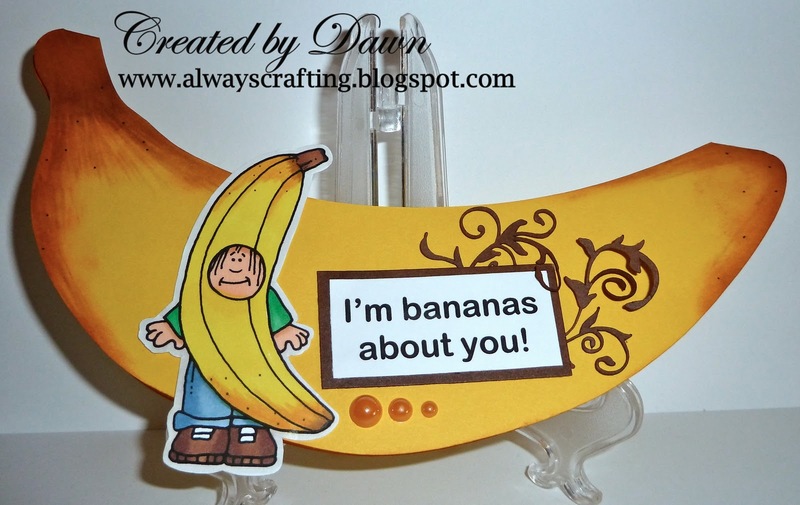 Oh sometimes Dawn you're such a "fruit-case" - sorry, couldn't resist, this is such a cool card!